The day before my eyelid surgery, my unparalleled agent, Kate Garrick of the Karpfinger Agency, sent me an e-mail titled, “You inspired a dance work! !” Kate elaborated that Stephanie Nelson, choreographer and artistic director of a contemporary New York City-based performance ensemble called the Stefanie Nelson Dancegroup, created an evening-length contemporary dance work partly influenced by Memory’s Last Breath: Field Notes on My Dementia. 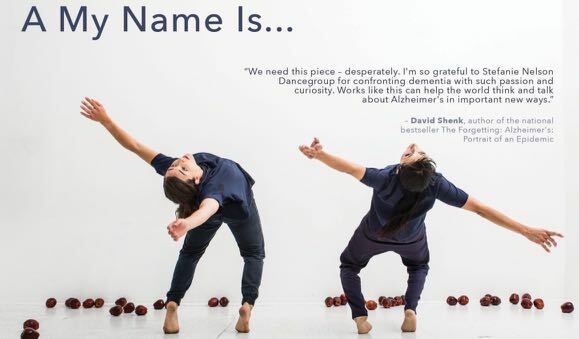 The dance piece is titled A MY NAME IS…, after the jumping-rope rhyme in which the movement “starts out precise and over time becomes disorganized and chaotic: an apt metaphor for memory and forgetting” (NYC Dance). The images (below) from the performance are from the Stefanie Nelson Dance Group website. The piece’s emotional origin derives from Nelson’s response to a series of happy birthday messages sent to her by a family member with dementia, who didn’t remember having sent the previous messages. “Each was poignant and quite heartbreaking,” she says. The truth about my inspirational contribution is only half as spectacular as Kate’s announcement sounds: during the research phase of the dance’s coming-into-being, my book was just one of Nelson’s outside influences–the other was Fraying at the Edges, an article by N. R. Kleinfield in the NY Times Magazine. Left, Castello Angioino Aragonese (Agropoli )and right, Piazza San Frediano (Lucca), July 2016. My word Gerda, you sure have hit the headlines with your Memory’s Last Breath. I finished reading it about a fortnight ago and have been wanting to tell you how much I enjoyed it. It really was an eye opener. I aim to lend it to a neighbour across the road in our complex, who works at LIVEWELL SUITES, an institute who cares for Alzheimer and Dimentia patients here in Somerset West. Martie’s husband’s last days was suffering from both. Hope you all had a great Christmas and best wishes for 2018. DIs wonderlike nuus. Jy is voorwaar op vele vlakke ‘n inspirasie!